The glasgow coma scale (abbreviated as GCS) is a tool created by Dr. Graham Teasdale used to measure a patient's level of consciousness (LOC) to determine the severity of a traumatic brain injury (TBI). A simplified version of this would be the AVPU scale. It uses a series of three different tests: eye opening (E), verbal response (V), and motor response (M). Use the number that correlates with the patient's absolute best response for all three categories when performing these checks. The result is calculated by adding up all three of the numbers giving a total score ranging from 3 to 15. The injury is then classified into one of these three categories. Use the calculator below as needed. 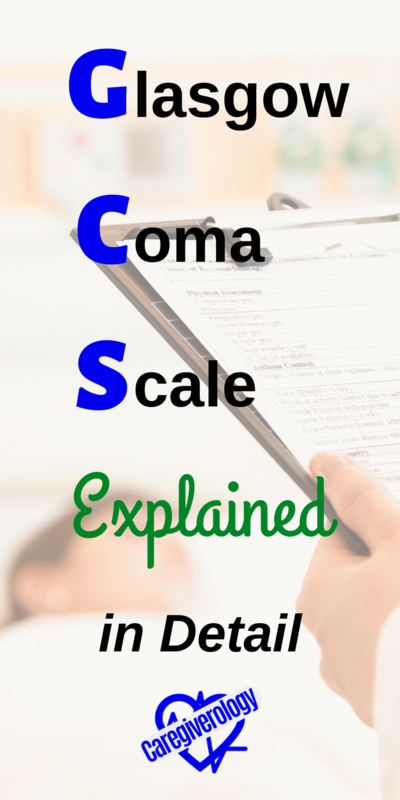 If the glasgow coma scale (GCS) score is not just a simple number, but also has letters, it could be a modifier. If the eye opening (E) score is not testable (NT), it may read as E1c or simply Ec. The c stands for closed. Similarly, the verbal response (V) may read as V1t or Vt. The t stands for tube (endotracheal tube which is used for intubation). These are still counted as a score of one. So for example, a final score may read as GCS 4tc. This would be interpreted as the eyes are closed (c) due to swelling and the patient is intubated (t). Both of these together equal 2 so the remaining amount (4-2=2) is left for the motor response (M). Therefore it can be assumed that the patient has a decerebrate response to pain. Reference: Teasdale G, Maas A, Lecky F, Manley G, Stocchetti N, Murray G. The Glasgow Coma Scale at 40 years: standing the test of time. The Lancet Neurology 2014; 13: 844 - 54.